For every stage of the development process, there's a resource ready to help you. Learn how to leverage various features of the Zoho Developer Console to build your application, with our free documentation, courses, ebooks, and webinars. Understand every aspect of extensions, vertical apps, custom apps, Deluge scripting, and the Zoho Marketplace with these detailed help guides. Comprehensive user guides with all the information you need to build extensions for Zoho. An in-depth tutorial that shows how to create your own industry-specific cloud application, step by step. This glossary gives a complete breakdown of all the Deluge tasks, functions, and data types you can use in your app's scripting. Everything you need to know about developing Zoho Creator custom apps that meet specific requirements of your clients. Publish custom apps for your clients alone or publish to marketplace for a larger audience. Provides a complete reference of all the tasks, functions and data types supported in Deluge, the scripting language integrated with Zoho Creator. Learn how Zoho Marketplace works, and how you can benefit by listing your extensions there. This course will walk you through all the necessary components to build your very own industry-specific application with Zoho Developer. Learn how to boost your app's functionality by adding widgets. Register for this course to access widget tutorials, sample source codes, and hands-on exercises. 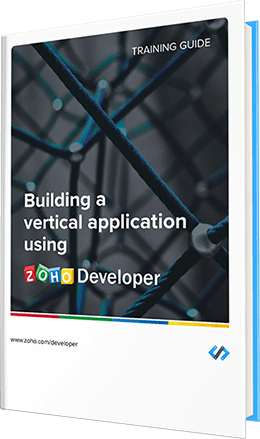 This ebook provides an overview of Zoho Developer's Vertical Program, and explains how you can leverage the console's features to build your B2B enterprise. With hands-on exercises, this ebook is more like your own workbook. You'll also get a deeper understanding of Zoho Developer's components.